VHH is the official non-profit partnership-based Destination Marketing Organization (DMO) leading economic growth through destination sales, consumer marketing, public relations, and tourism development for Dauphin County, Pennsylvania. The organization is committed to actively marketing the tourism assets in the Hershey & Harrisburg Region to business and leisure travelers both domestic & international. The bureau also leads regional sales efforts to attract meeting & event organizers, sporting event producers, and group tour leaders. In August 2017, the visitors bureau name was officially changed to "Visit Hershey & Harrisburg" after doing business as the "Hershey Harrisburg Regional Visitors Bureau" for the past 12 years. 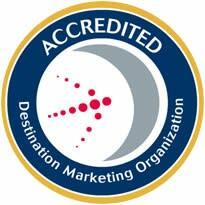 In 2010, the bureau earned official accreditation from Destination Marketing Association International (DMAI). Prior to 2005, the organization was referred to as the "Capital Regions Vacation Bureau, Inc."
Learn more about this organization under the "ABOUT" tab on VisitHersheyHarrisburg.org, including Staff & Board Directory, Affiliations & Associations, and Tourism Statistics. HHSE was launched as an official division of the regional visitors bureau organization in July 2016. Read more. To generate economic growth and stability through the marketing and promotion of travel to the Hershey & Harrisburg Region and to coalesce, develop, and expand its hospitality industry, products, and workforce. Want to Sell Us Advertising or Other Paid Media Services? Sales Reps should NOT contact the Public Relations Department regarding Paid Media Opportunities, Advertising, or other Contracted Services. Want to Become Our Partner In Tourism? To become an active member in the sales, marketing, and public relations programs offered by VHH or to learn more about the benefits of becoming a Partner In Tourism, please contact our Director of Partnership Development Justin Martsolf at Justin@HersheyHarrisburg.org or call 717-231-2986. Want Our FREE Travel Guide? Mail: To receive a guide by mail, email or call our office at Info@HersheyHarrisburg.org or call 877-727-8573. Hotels: The guide is on display or available upon request at the front desk at most lodging properties in the region. Harrisburg Visitor Center: The guide is available at the Harrisburg Downtown Improvement District Visitor Information Center located at 22 North Second Street, Harrisburg, PA. See the daily hours of operation at HarrisburgDID.com or by calling 717-236-9762. Visit Hershey & Harrisburg Office: The guide is also available at our office location during regular business hours. 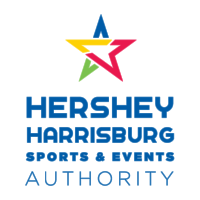 The Hershey & Harrisburg Region encompasses Dauphin County, PA.
Dauphin County is marketed by the regional tourism bureau as the Hershey & Harrisburg Region. Tourism officials have established this destination brand to highlight the region&apos;s most iconic and widely-recognized attractions. The region is the proud hometown for Hershey Foods and the Commonwealth&apos;s Capital City of Harrisburg. Both distinct areas of our region offer a wonderful mix of modern amenities with a wealth of historically significant story lines. The town of Hershey dates back to American confectioner and philanthropist Milton Snavely Hershey who founded his now-famous Hershey Chocolate Company here in 1894. Harrisburg was founded by English Trader John Harris, Sr. in 1719 and became the Capital of the Commonwealth of Pennsylvania in 1812. Dauphin County was created from a portion of Lancaster County during a meeting of the Pennsylvania legislature in Philadelphia on March 4, 1785. 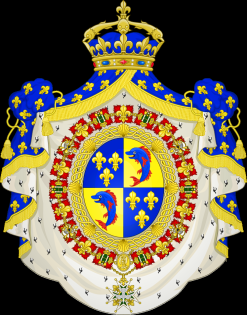 The new county was named "Dauphin" for the 3-year-old Louis Joseph, Dauphin of France to honor the child&apos;s parents King Louis XVI of France and Marie Antoinette for their support in the American War for Independence from Great Britain. Louis Joseph, who had suffered from fragile health conditions most of his young life, died of tuberculosis on June 4, 1789 at the age of seven and a half. The term "Dauphin" was the title given to the eldest son of a king of France, or the heir apparent to the French crown from 1350-1830, according to the Merriam-Webster Dictionary. The population in Dauphin County is 273,000 according to the 2016 U.S. Census Bureau, yet the tourism bureau estimates the area hosts approximately 10 million visitors annually. According to tourism officials, the region records an average of 5 million room-nights sold each year in the 80 hotels located in Dauphin County (2016 report). That equates to a 20-1 ratio of visitors to residents annually. The county is considered part of the Harrisburg-Carlisle, PA Metropolitan Statistical Area (MSA). According to the U.S. Census Bureau, the county has a total area of 558 square miles, of which 525 square miles is land and 33 square miles is water. Dauphin County is located in the south eastern quadrant of Pennsylvania. This geographic location within the Mid-Atlantic Region of the U.S. makes our destination easily accessible from major domestic and international markets. 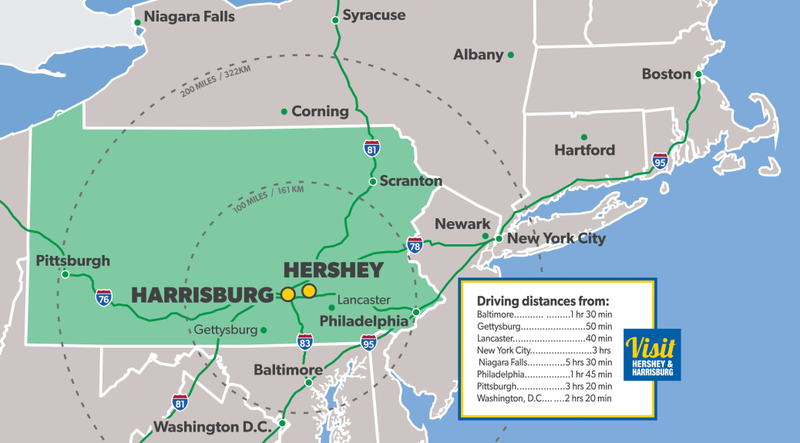 Forty percent (40%) of the U.S. population and more than sixty percent (60%) of Canada’s population live within a 500-mile radius of the Hershey & Harrisburg Region. An extensive inter-modal transportation system of highways, railroads, ports and airports easily moves people and goods to & from our area. The abbreviation for our airport (MDT) represents its physical location in Middletown, PA. Locally the airport is called "HIA"
The airport is 12 miles from Hershey, PA and 25 minutes from Harrisburg, PA.
Philadelphia to Harrisburg Main Line - This service travels east from Harrisburg, PA to Philadelphia and onto New York City along the Northeast Corridor. The average travel time from Philadelphia&apos;s 30th Street Station is 2 hours and from New York&apos;s Penn Station is between 4-5 hours. Keystone Corridor - This service travels west from Harrisburg, PA to Pittsburgh, PA along the Norfolk Southern Railway Pittsburgh Line. This section of AMTRAK&apos;s Keystone Service is sometimes called the "Keystone East." The average travel time from Pittsburgh is 5+ hours. This is a limited-access toll highway running 360 miles east-west across the Commonwealth from Ohio to New Jersey. From the Ohio border the toll road travels approximately 245 miles to Harrisburg, PA.
From the New Jersey border the toll road travels approximately 115 miles to Harrisburg, PA. When it opened on October 1, 1940 it was the first long-distance limited-access highway in the U.S. and served as the prototype for future highways of its kind as part of the Interstate Highway System. The original roadway featured 7 tunnels that were abandoned by the South PA Railroad in the 1880s. Today the modern highway has only 4 tunnels that cross Pennsylvania&apos;s Appalachian Mountains. The highway crosses five major rivers in Pennsylvania including the Susquehanna River between Dauphin County and York County. The Susquehanna River Bridge is 5,910 feet long, which is the 2nd longest bridge span along the PA Turnpike. The longest being the Pearl Harbor Memorial Extension of the New Jersey Turnpike toll bridge which spans 6,571 feet over the Delaware River. The speed limit for this road is 70mph with a few exceptions for construction zones, tunnels, toll plazas, and winding portions that require slower speeds for safety. In 1894, Milton Hershey founded his now-famous Hershey Chocolate Company in a small farming community known as Derry Church, located within Derry Township only 14 miles east of Harrisburg. Milton grew up in the area and recognized the dairy lands would provide the high grade of milk required for his milk chocolate recipe. Once mass production began in 1905, the cornfields surrounding the original six-acre factory transformed into the model industrial town that Milton Hershey envisioned. In 1906, the U.S. Postal Service opened a branch and designated the mailing address for the area as "Hershey" because the chocolate company brand name was now more widely recognized than Derry Church. Hershey is located in Derry Township within Dauphin County, Pennsylvania. The population of Hershey, PA according to the 2010 U.S. Census Bureau is 14,257. Hershey is 14.4 square-miles at an elevation of 410 feet. Only .08 square-miles of the area is water. 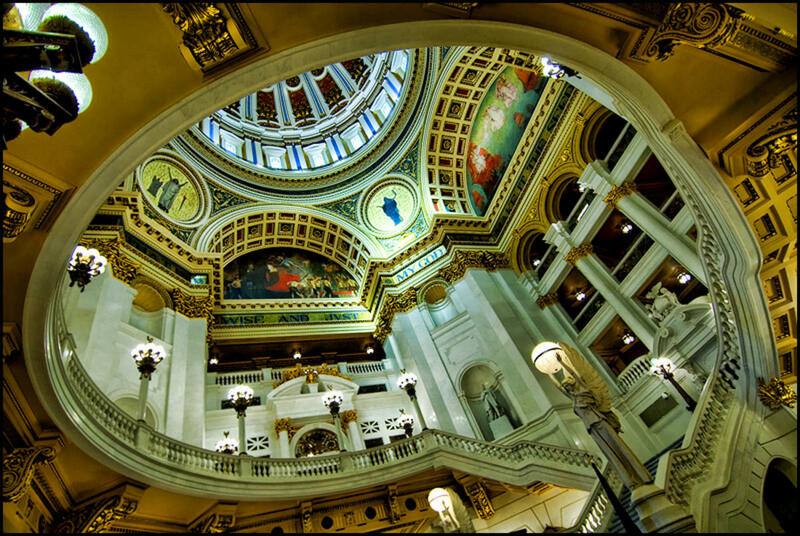 Harrisburg is the Capital of Pennsylvania and serves as the county seat for Dauphin County. Harrisburg&apos;s location along the Susquehanna River is thought to have been inhabited by Native Americans as early as 3000 BC. The area, known to the Native Americans as "Peixtin" or "Paxtang," was an important resting place and crossroads for Native American who traveled trade routes connecting the Delaware River, Ohio River, Potomac River, and the Upper Susquehanna River. 1719 - English Trader John Harris, Sr. settled in this area and 14 years later secured grants of 800 acres. 1785 - John Harris, Jr. made plans to lay out a town on his father&apos;s land and named it Harrisburg. 1791 - Harrisburg was incorporated. 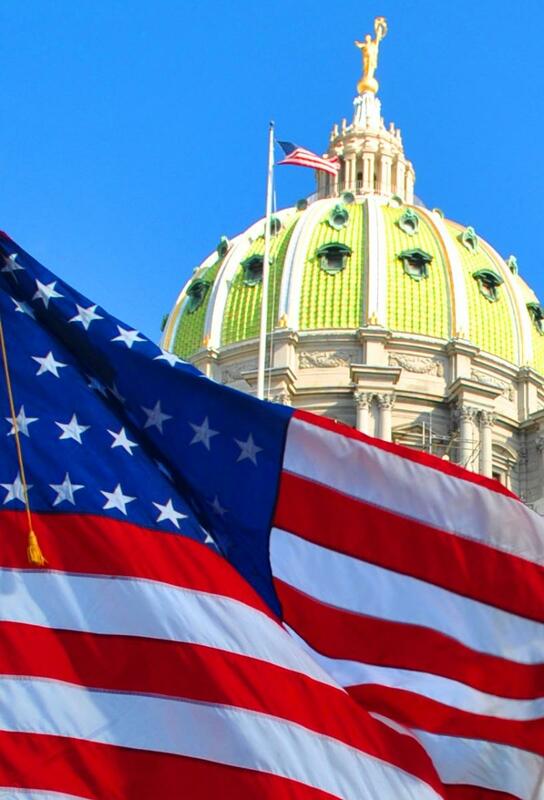 1812 - Harrisburg was named the Pennsylvania Capital. 1839 - The first national convention of the Whig Party of the U.S. was held in Harrisburg. 1861 - Camp Curtain opened on April 18, 1861 in Harrisburg and went on to become the largest Federal camp during the American Civil War. The city&apos;s central location on major railroads running east-west and north-south made it ideal for moving men & supplies to the Union Armies in the field. Until it closed on November 11, 1865, the camp was used by more than 300,000 soldiers and served as a supply depot, hospital (for both sides), prison camp, and a final mustering point for troops returning home. 1906 - President Teddy Roosevelt gave a speech at the dedication ceremony for the current Pennsylvania Capitol Building and proclaimed it "the handsomest building I ever saw." Today the complex is considered a "Palace of Art." During the 19th century, the building of the Pennsylvania Canal and later the Pennsylvania Railroad allowed Harrisburg to become one of the most industrialized cities in the Northeastern United States. Harrisburg is the tenth largest city in Pennsylvania. The population of Harrisburg, PA according to the 2010 U.S. Census Bureau is 49,528. The City of Harrisburg is 11.86 square-miles at an elevation of 320 feet. 3.73 square-miles of the area is water. The main waterway is the Susquehanna River. The county is bound to its western border by the Susquehanna River, the longest river on the East Coast of the U.S. that drains through the Chesapeake Bay into the North Atlantic Ocean. With its watershed, it is the 16th-largest river in the U.S. and the longest river in the early 21st-century continental U.S. without commercial boat traffic. This National Historic Landmark is the most recognizable feature of the Harrisburg skyline. 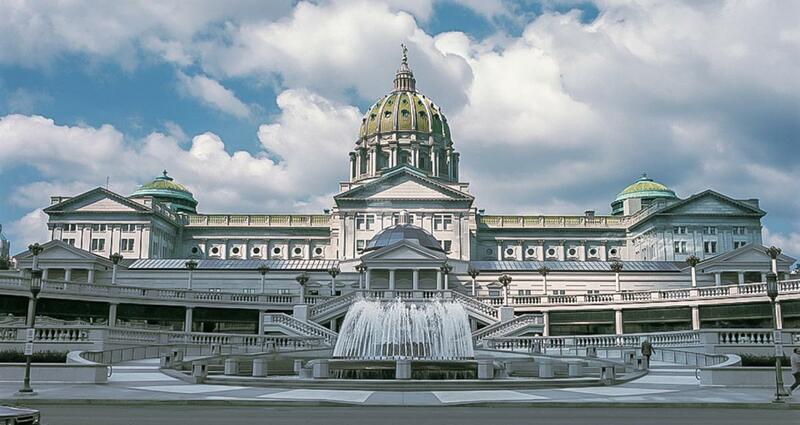 Dedicated in 1906 at the cost of $13 million the Capitol was designed to be a Palace of Art. 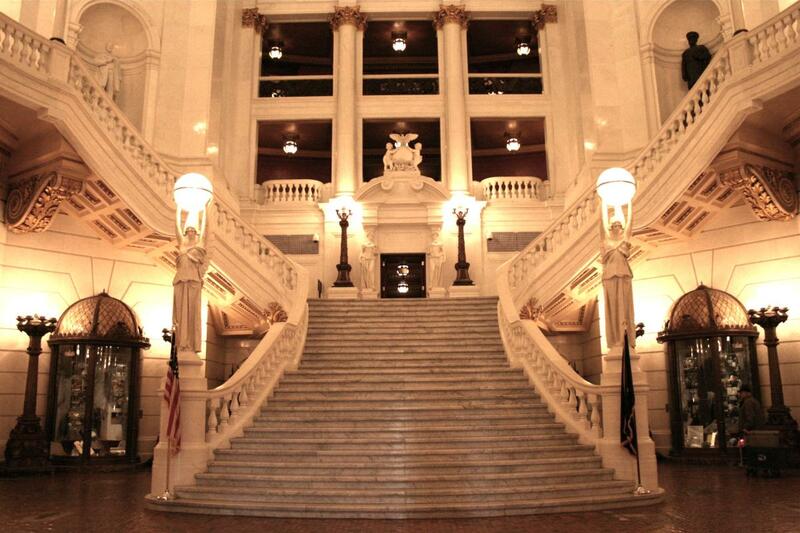 The Capitol contains 475 rooms and has four floors, a mezzanine and a basement. The massive bronze doors of the capitol entrance lead visitors into the first-floor main rotunda highlighted with a grand imperial staircase similar to the one in the famous Palais Garnier (Paris Opera House) in Paris, France. Free 30-minute guided tours daily reveal the stunning artwork, craftsmanship, and various Renaissance designs capped by a spectacular dome that is a 1/3 scale replica of the one on St. Peter’s Basilica in Rome. 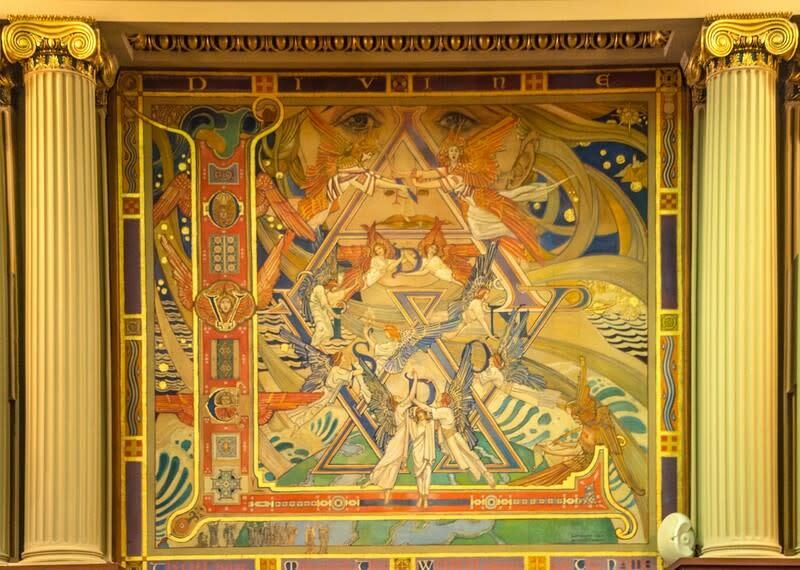 Pay particular attention on the tour to the paintings in the Supreme Court Chamber by Violet Oakley, the first American woman to receive a public mural commission. 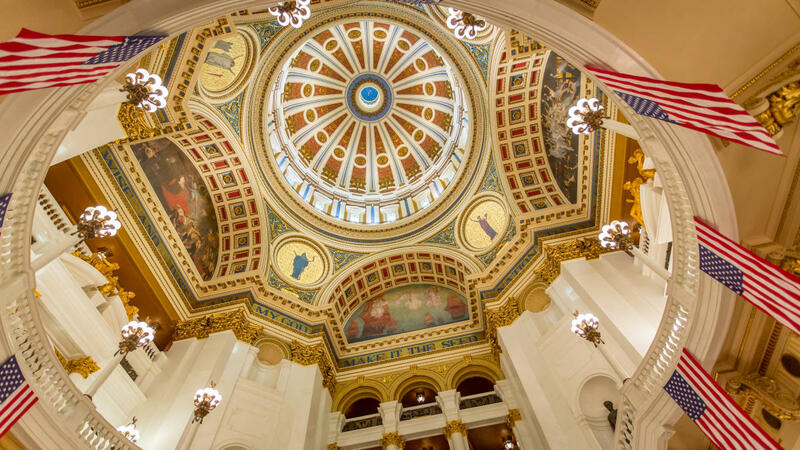 TripAdvisor users ranked the Pennsylvania Capitol Complex Tour #1 for “Top Things to do in Harrisburg” (2017).